Kohler Chesapeake wall-mount lavatories can be attached to the wall at a comfortable height and are practical where space is premium. Most wall-mount lavatories include a matching shroud for placement beneath the basin to conceal the from the Manufacturer When your sink is in high demand, demand quality materials. 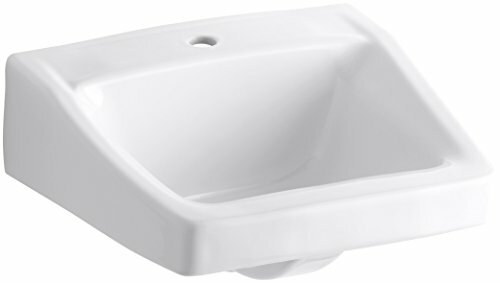 The Chesapeake wall-mount lavatory provides outstanding performance ideal for commercial settings. You can count on durable vitreous china construction to maintain its hard, nonporous finish for a remarkably clean, sanitary lavatory and years of reliability. This ledge-back sink features a single-hole faucet drilling.